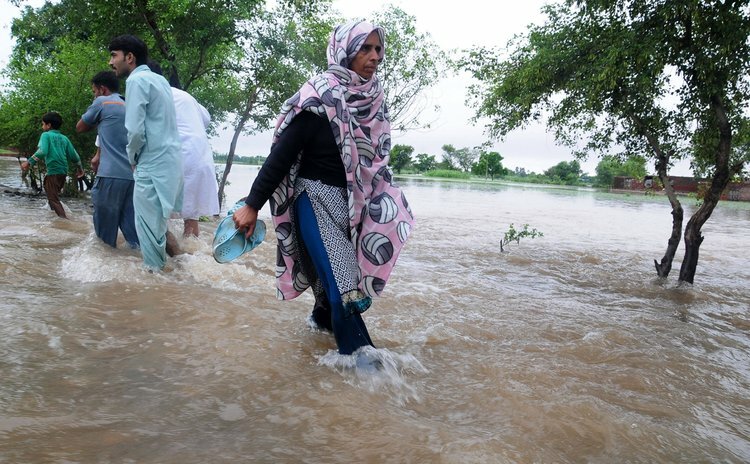 ISLAMABAD, Sept. 5 (Xinhua/Sun) -- At least 165 people were killed and over 200 others injured when torrential rains hit parts of Pakistan's Punjab province and northeast Kashmir area over the last three days, local media reported Friday. Local disaster management authorities said that the separate rain-related accidents were mainly caused by roof collapse, electrocution and minor road mishaps and accidents caused by overflowing streams and drainages in various areas of the country. Geo TV said that Punjab's provincial capital of Lahore was the worst hit area where over 70 people were killed and several others injured in separate accidents. A total of 45 people including three school kids and a three- member family of a British national of Pakistani origin were killed in other parts of the province. Rain water inundated several low lying areas in the province, trapping hundreds of people inside their houses. Air and railway traffic was also disrupted by the heavy downpour. Torrential rain killed 50 people including three soldiers in Pakistan administered Kashmir area, the disaster management authority said. Eight kids were injured when roof of a seminary collapsed in the country's capital city Islamabad. Reports from different parts of the country indicated huge losses to property, cattle and crops due to overflowing drainages and streams. The Met Office said heavy rains and thunderstorms are expected in the Punjab and Kashmir during the next 36 hours which may also cause flooding in major rivers. The country's Prime Minister Nawaz Sharif took notice of the situation and chaired a meeting to review rain and flood situation in the country. The prime minister was informed that parts of Kashmir have received 668 millimeters of rain, Islamabad got 316 millimeters, and Lahore 350 millimeters of rainfall during the last 48 hours, resulting in flashfloods in Kashmir and northeast Punjab. The prime minister has ordered the National Disaster Management Authority and the Punjab government to ensure immediate rescue and relief activities in the rain-hit areas. Pakistan army has also extended its services for providing rescue and relief to the affected people. According to Inter Services Public Relations, the mouthpiece of Pakistan army, troops have been dispatched to the flood affected areas for relief duties. Monsoon rains normally hit Pakistan in June and start retreating in the first week of September. Heavy rainfall in September is quite uncommon due to the weather phenomenon determined by geographical location of the country. However, in the last three years, the country has observed widespread rainfall in this month due to climate change.